I am pleased to introduce another new InterNations venue. Fratelli Fresh Darling Harbour is a vibrant Italian food and dining emporium with an amazing food and drink selection; including Vannella Cheese, Salumi Australia, Sonoma Bakery, Mecca Coffee, as well as Italian hero brands, Baci chocolate and Campari, and iconic American craft beer pioneer, Goose Island Beers. We have managed to reserve an exclusive indoor and outdoor area for InterNations. 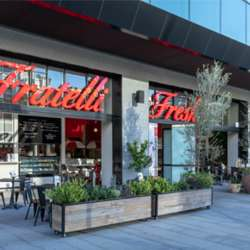 I am looking forward to our first event at Fratelli Fresh Darling Harbour.